Sign up for my newsletter to receive news and updates in your inbox! As a result of his wife returning home with a surprise, George Cooper of Pirate’s Swoop clears out the boxes in his old nursery. The Spy’s Guide is one box of what he finds. 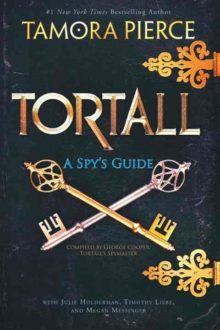 A collection of letters, pamphlets, and notes on the spy system that he, Myles, and Evin Larse developed after he became the Whisper Man, it explores Tamora Pierce’s world through the eyes of the people who live there. It includes diplomatic advisories, rabble-rousing posters, Daine’s notes on the immortals compiled for George himself, and a whole lot more. The Guide is chock-full of never-before-seen material, illustrations, and updates on the lives of friends old and new. Julie was born in the dead of a Minnesota winter to a mother who will never let her forget how wide her shoulders were on the way out. A storyteller from a young age, when she wasn’t asking her parents to write down tales of unicorns and little girls on adventures, she was coming up with ridiculous lies about her own life. © 2019 J. A. E. Holderman. Website design by Clockpunk Studios.